2018 New VersionVR Virtual Reality headset is a newly designed based on improvements of other VR headsets, New conception and perfect materials are built in it. This is the best choice to experience 360бу immerse VR technology's trends & spectacular! PLEASE NOTE: The remote is not game remote. It can only control the videos pause or play,volume up or down,forward or backward etc. If you need to play games,we suggest you choose a professional game remote. REVOLUTIONARY OPTICAL SYSTEM: This combined with nanoscale process 40mm high definition optical PMMA aspheric lenses and large field of view ( FOV up to 120°). Immerse yourself in a world of virtual reality. Easy adjustment of pupil distance (PD) and focal distance (FD) bring you enjoyable experience without wearing glasses, catering up to 800 degree of shortsightedness. HIGH-FIDELITY HEADPHONES BUILT-IN: HD stereo sound and 112 dB high sensitivity give you a real scene sound effect. Includes Volume Control and Play / Pause / Answer Call function keys. Slow rebound memory sponge leather ear pads reduce the oppression to the ear, which isolate the noise from others. ERGONOMIC DESIGN: Large mesh weaving and soft sponge layer, which is anti-allergic, breathable sweat and comfortable, is easy to remove and clean. Larger nose space is designed to meet different facial and prevent your nose being hurt. LIGHTWEIGHT & COMFORTABLE HEAD WEAR: Made of high-quality & skin-friendly material, largely reduces the weight of vr headset and keep your face and eyes comfortable even after hours of wearing. Ergonomic straps with the buckles is easily to adjust and fit for different size of heads. ( Both adults and children). 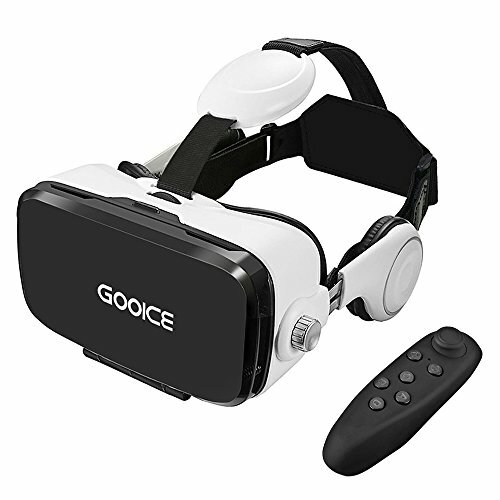 If you have any questions about this product by Gooice, contact us by completing and submitting the form below. If you are looking for a specif part number, please include it with your message.